UMP | University of Minnesota Press Blog: Egypt Q&A: Unrelenting protests are rooted in many years of civil unrest and bear the marks of a social revolution. Egypt Q&A: Unrelenting protests are rooted in many years of civil unrest and bear the marks of a social revolution. 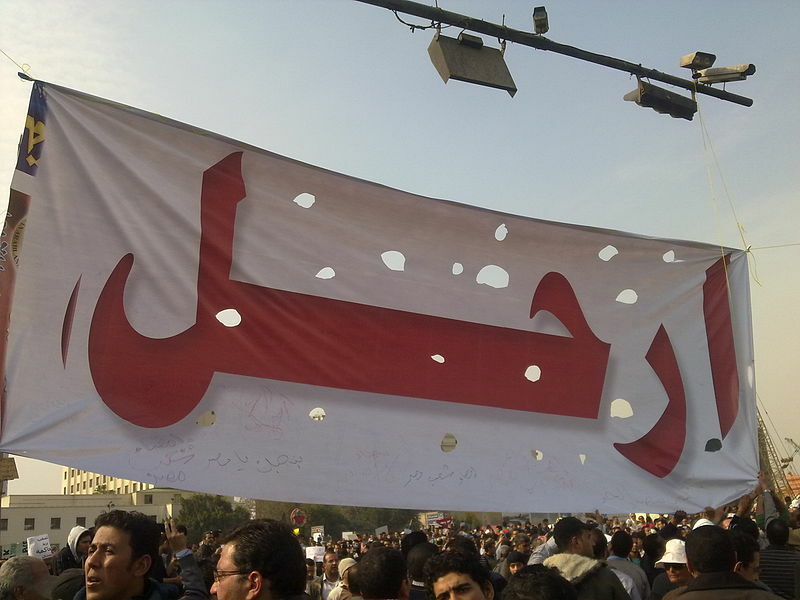 In Cairo, Egypt, a big banner that spells out "Leave," in reference to Egypt's president Hosni Mubarak, appears on Feb. 1st, 2011. Throughout the Mubarak regime's tenure, citizens have experienced violations of their civil rights on a daily basis. Photo by Essam Sharaf, courtesy of Creative Commons. Photo from Flickr. Vast segments of Egyptian society have economic, social and political grievances that they have been articulating both in public discourse and action for more than a decade now with little response from the Mubarak regime. We have seen successive waves of protest by workers in both public- and private-sector industries, by professionals, university professors, civil servants and students. A key issue has been the growing socio-economic disparities, with a tiny elite monopolising most of the economic resources of the country and blocking all possibilities for political change through the existing institutions. While elections were routinely rigged, severe restrictions were set on the formation of new political parties and civil society actors were harassed and persecuted on a regular basis. The regime and the institutions on which it rests not only failed to respond to the basic needs of the people, having withdrawn most of the welfare provision policies at a time when food prices and utility tariffs increased significantly, but have also put obstacles in the way of peoples’ efforts to meet their material and cultural aspirations. Government policies promoted the interests of a small group of businessmen and created conditions for the emergence of oligopolies and monopolies. A significant number of public-sector enterprises were privatised without guarantees for workers’ rights and without any planning for employment growth. Industrial sectors such as the textile industry were left to decline and reach near collapse conditions. In denying the economic, social and political rights of the people, the regime relied on the police to rule the country with an iron fist. Police officers under emergency laws - in effect since Mubarak came to power in 1981 - gained extensive powers and deployed a great deal of violence to control the population and to stem any resistance. Ordinary citizens and youths in particular faced police brutality and abuse of authority on a daily basis. Q: How long has this situation been brewing? A: It is difficult to say that the Mubarak regime has ever had substantial support among the population. During almost the entirety of its existence, various groups have challenged the regime. However, sustained opposition has been growing for at least ten years now and has come to include a cross-section of society. There are multiple factors here. First, people have experienced, as part of their everyday realities, violations of their civil rights and have become fearful for their security and safety—owing, especially, to continued violence by police personnel. Highly publicized incidents of police abuse and torture of civilians such as the Khaled Said case (concerning the young man who was beaten to death in Alexandria, Egypt, in 2010 by two policemen) have been a catalyst for uniting people in their rejection of these practices. Second, the possibility of bringing about change using conventional channels of opposition has been non-existent, as elections are rigged and opposition parties are besieged. The elections in November 2010 were just the latest example of this. Third, those youths who were offered nothing by the regime and who were the main object of its security politics came forward as the most imaginative actors undoing the chains that tied the society as a whole. Using Facebook and other new media, a new generation carved out spaces for discussion and debate and for working with activists from different political backgrounds. Q: Your book (Political Life in Cairo's New Quarters) looks at how Cairo's government uses surveillance techniques and violence to disperse opposition to the state. What do you make of Egyptian government's decision to shut down the Internet and cell phone service? A: These acts are a continuation of the politics of security that consisted of continuous surveillance of the population. The regime deployed police to monitor youths on the streets, using the procedures of ‘stop’, ‘arrest’ and ‘investigate ‘(known as ishtibah wa tahari). This was designed to restrict young peoples’ free circulation and gathering. The youths have put to remarkable use the tools of virtual communication to organize, meet and mobilize, thus circumventing the regime’s use of physical force that tried to undermine their capacity to meet and plan. The Internet’s disconnection confirms that the regime fails to understand the strength and depth of the opposition and the nature of the peoples’ demands. While protesters were striving for freedom, the regime responded by placing greater restrictions on them, cutting them off from means of communication and trying to isolate them. Q: How could the US and its allies be directly (or indirectly) affected by the possibility Mubarak's government could fall? A: The US government and its allies should take lessons from events in Egypt about the need to respect peoples’ will and determination to achieve freedom and dignity. Propping up authoritarian rulers in the Middle East or elsewhere is a recipe for instability and conflict in the long term. Most importantly, the events in Egypt demonstrate that the Western government’s fears about radical Islamists taking over from their authoritarian allies are not very well-founded. The protests in Egypt show that peoples’ primary objectives are focused on the protection of civil and political rights and on achieving greater equity and ending corruption. A particularly Islamist agenda is clearly absent here. It is important that the US and its Western allies move away from this tunnel vision that there are only two political options available to the people in the Middle East: either authoritarian governments or Islamic governments. Q: Any thoughts on how long this could go on? A: The developments in Egypt bear the marks of a social revolution. I think that we will be witnessing ongoing transformative processes that will mobilize a lot of energies for a long time to come. Salwa Ismail is professor of politics at the School of Oriental and African Studies, University of London. She is author of Political Life in Cairo's New Quarters: Encountering the Everyday State (Minnesota 2006).